Commonly known as Taro or Elephants Ear Plant, Colocasia esculenta antiquorum is a wonderful foliage plant that will reach nearly 2m in height. The large green to purple leaves are nicely veined and an added attraction are the yellow flowers that appear on tallish stems. Used as an ornamental aquatic plant in Australia is does require some warmth to thrive. As with many of its relatives this is a variable species and in fact has been highly hybridised. However its origins are as a food crop rather than a garden plant. 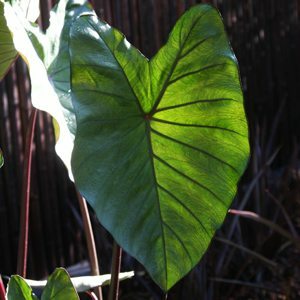 The name ‘Elephant Ear Plant’ is widely used to describe a range of plants, best keep to botanical names to be accurate. Moist conditions are essential, so next to a pond or in a pot that can be used to hold a water retentive potting mix, or simply grow in pot that is immersed in a larger pot full of water. For best results protect from strong winds and the hot afternoon sun. Ideally you would grow these attractive plants in the margins of a pond, however they can be successfully grown in containers. They will still need moisture, so pots will need to be placed in water over summer. When grown in pond margins, they are still best in containers that can be submerged. Use a humus rich fertile potting mix, add some well rotted compost. Plant the corms about 8 cm deep. Find a position in full sun. Place the pot in the pond or keep very moist. Fertilise regularly for good growth. A pelletised slow release type is best. Remove spent foliage as it dies back. In very hot areas, you may need to provide some shade during the hottest part of the day during summer. Propagation by division when dormant is simple.